"Kids love it! 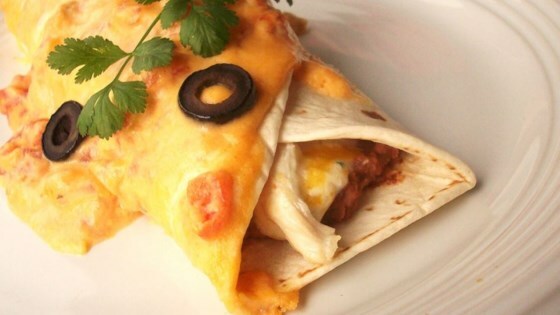 Mild (not spicy) yet flavorful enchiladas featuring typical Tex-Mex flavors. Rico!" In a medium bowl, mix the chicken, onion, 1 cup Cheddar cheese, and 3/4 cup sour cream. Disperse the mixture evenly among the 8 tortillas. Roll into enchiladas, and arrange in single layer in the prepared baking dish. In a saucepan over low heat, melt together the remaining Cheddar cheese and sour cream. Pour over the enchiladas, and top with tomatoes and olives. Bake in the preheated oven for 20 to 30 minutes, or until hot and bubbly. Garnish with tomatoes and olives.